Designed to replace other utility helicopters, the surprisingly stable Dragon dwarfs most other helicopters, mainly in girth. It can even handle small vehicles in it's bay, provided the seating is removed or folded up. Needless to say, when supporting or transporting troops for ground combat missions, it makes an easy target. This aspect was sighted early on, and to counter RPG and other shoulder-mounted Anti-Air fire, it supports an enhanced TROPHY system, able to counter anything that might fire at it from the sides or below, though the top is still somewhat vulnerable from closer distances. It maintains enough personal weaponry within it's bays to clear out any SAM or Anti-Air sites on it's initial entry, as well as having it's 25mm chain gun for any enemy personnel that might stand in it's way, which is able to track nearly as fast as the gunner can move his head to target with it. With the advent of improved digital systems relieving much of the load of the operators, the gunner and crew chief both act as Electronic Warfare specialists as well, able to defend against enemy vehicles and SAMs. For carrier operations, the AUV-50 Dragon can also maintain a good deal of the carrier's necessary Carrier On-Board Delivery Operators, though it's range is not as extensive as previous aircraft; new models are in the works for the UV-50B, which will cover such needs, as well as Midair Refueling, and an EV-50B, which will cover Midair Refueling and AWACS needs. The Falcon from Halo: Reach. This certainly isn’t that, though it was inspired by it. 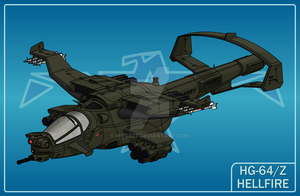 Do you plan to expand on this or your other vtol or helo designs? Cool bird.Wish I had one. One of my favourite tiltrotor designs. Nice work! Wow. I'm very impressed with this design. Just a question though. Does the 25-Mike have a 365-degree turnabout rating? I ask because you made it sound like the gun was slaved to the gunner's helmet, but I was thinking it would be more operational capable by giving it a 360 turnabout with mounted standard/thermal cameras. Correct me if I'm wrong or if there would be a technical issue. Both; it can be slaved to the pilots helmet, or "disconnected," for a full turn radius. Sweet deal! Great work on the design. Don't worry about how it looked kinda like an V-22, because that's the case with pretty much every Tilt-Rotor. As for the looks themselves, it looks like an RAH-66 Comanche mixed with a UNSC Falcon. Also, the fact that the 74-foot length would mean that canopy is a tad big it totally excusable, because if you're able to get up to altitudes of up to 42,000ft, almost 10,000ft higher than Everest, you'll want to enjoy the view! But in all seriousness, a TILT-ROTOR at approximately 8 miles is hugely impressive, even if there's turboprops on those nacelles as well. If we ever build something with similar specs to this, the V-22's days are limited, VERY limited! Let's just hope we'd be able to make an electric model that could work on Mars, because that would speed up colonization immensely. Excellent work indeed I do like the details of the interior as well. It gives it an extra dimension.